Today is Sunday, May twenty-seven, and I just emerged from my second week in Spain. Wow! It went by really quickly, but at the same time, it crawled by at a glacial pace. Time is funny that way, isn’t it? It never does what you want it to or expect it to. Anyway, it’s incredible how many amazing things can happen in ten days when one is abroad. 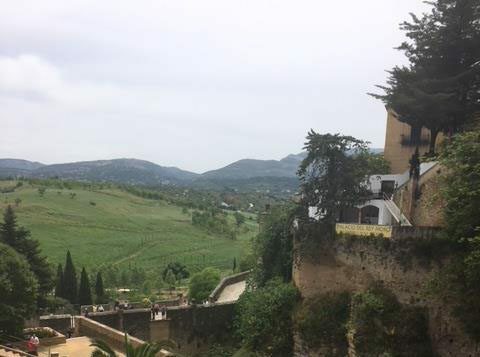 I’ve been to Europe before, but that was roughly five or six years ago, and I’ve had more fun in my first two weeks in Spain than I did in my entire previous Europe excursion. That was only two weeks long, and we visited roughly five countries, so I didn’t really have much time to appreciate what I saw. It was also my first time out of the country, so I was a bit too dazed and doe-eyed to understand much of what was happening. But that won’t happen this time because I’ll be in the same country for two whole months, so I don’t have any excuses for not learning anything. The first thing I learned this week is how amazing tapas are. If you aren’t familiar with the term, “tapas” are essentially appetizers or snacks unique to Spanish cuisine. The portions are smaller than normal-sized meals, which means they’re just about perfect. Tapas are best experienced with friends because you can get a handful of different plates and share them all. This is what we did on Monday the twenty-first. Our large group split up into three sections, and we took turns going out for tapas with Esther and Diego, two friends of our friend and leader, Jenna. Esther and Diego took up to the centro or downtown of Seville, where there are a plethora of bars and restaurants to choose from. I can’t remember the name of the one they took us to, but I do know that they had roughly fifty bull heads on the walls and incredible tapas. We ordered about five or six dishes to split within our group. When the waiter handed me a menu, I had no idea what I was looking at, so I let Esther and Diego choose which ones we were going to try. Even though I couldn’t hear what Esther was saying as she explained each tapa from the other end of the table, I trusted her judgement. As it turns out, she knew what she was doing, because I had never tasted anything quite as amazing as croquetas con queso y salsa de frambuesas. Croquetas are a staple tapa in Spain. They’re essentially like miniature versions of hot pockets, and you can put anything you want inside of them. Croquetas can contain anything from ham or cod to spinach and garbanzo beans. The particular croquetas we had were roughly three by two inches and filled with thick, molten cheese. The shells of croquetas are typically thin and fried to golden perfection, and our cheese croquetas were drizzled with salsa de frambuesas, a sweet, dark purple raspberry sauce. They were my favorite, and I totally should have taken a picture, but I was too busy eating them. Despite my immediate partiality towards the croquetas, I did thoroughly enjoy the other dishes. The second one I tried looked and tasted like super watery french fries with a liberal amount of salt and something sweet and oily. As it turned out, they were fried eggplant sticks covered in molasses. Okay, sure. Why not? I can’t remember what the third one was, but it was shrimp wrapped with bacon, so it doesn’t really need an explanation, does it? They were very similar to the miniature sausages wrapped in bacon that my family makes during the holidays, only instead of being coated in brown sugar, they were swimming in a duet of two other kinds of sauces that I also can’t remember the names of. All I know is that they were so good, I ended up dipping my bread in the leftovers. By the way, bread, or pan, is always, without fail, a part of every meal in Spain. It’s so common, they use it like a fourth, edible utensil. I do remember the names of the last two tapas because they have very memorable characteristics: cola de toro and solomillo al whisky. Solomillo al whisky is the fancy, Spanish name for pork and potatoes soaked in whisky. It’s very good, and, I imagine, fairly straightforward to make. It’s got a very distinct smell (that’d be the whisky), but a surprisingly mild taste, without losing too much of its flavor. Cola de toro is one of those dishes you have to try before they tell you what it’s called in English. It doesn’t bother me, but some people might get turned off knowing that they’re eating bull tail. Honestly, it tastes like pot roast. If I closed my eyes and tried both of them consecutively, the differences would be almost imperceptible. The meat of cola de toro is creamier and more tender than regular pot roast, and it’s got a delicate smokey aftertaste. In comparison to some of the other food Spain is known for serving, bull tail ranks low to mild on the exotic scale. In Spain, everything I participate in is another opportunity to better my speaking and comprehension. This is true of things like going out for tapas and gelato (another incredible European staple) with Esther and Diego, but also walking to and from school every day with my roommate, Emma. Nonetheless, one of the most exciting opportunities I have to develop my language ability is with my intercambio partner. Intercambios are chances to receive, but also to give. In addition to TCCSevilla (the program for Americans learning Spanish), the school also has a program called AmericanLand for Spaniards who want to learn English. At the beginning of the semester, if we were interested in being paired with a speaking partner, we were given a chance to sign up for an intercambio. It was never really an option in my mind. I was excited about it long before I even left the United States, because when will I get another opportunity to teach someone English? Furthermore, as an aspiring teacher, the idea of helping someone develop their English while I develop my Spanish is an invaluable experience. Just ask anyone who was on the trip with me, and they’ll confirm how thrilled I was to meet with my intercambio. My intercambio partner, Álvaro, and I met on Tuesday the twenty-second. I had been in contact with him for several days previously, and we planned to meet for café con leche in a plaza called Puerta de Jerez. For lack of a better word, it was lots of fun. I was a little nervous, of course, because I wasn’t sure how much English he knew, nor how much time we would spend talking in Spanish. As it turned out, it was about half and half. We both agreed that when we were talking in a language the other person didn’t know, we’d speak really slowly and clearly. He told me that it bothers him when people speak really fast in English, which is exactly what I think when people talk in Spanish. I, of course, wasn’t aware that we speak so quickly in English (in fact, I always thought we spoke rather slowly in comparison with every other language), but it is my first language, so I guess it makes sense. Overall, it was easy to communicate what we wanted, but we definitely had our moments of blank stares, misunderstandings and laughter. The dynamic of speaking with my intercambio was a lot different than speaking with one of my professors or my host mother. For me, it’s preferable speaking with Álvaro than anyone else who doesn’t know English. Why? Because he’s in the same boat as I am. Since we’re both trying to learn each other’s language, this automatically creates a shared connection and understanding. We’re meeting again in a week or so, and we’re going to create pruebas or quizzes for each other to take. Suffice it to say, I’m thrilled to teach him what I know. 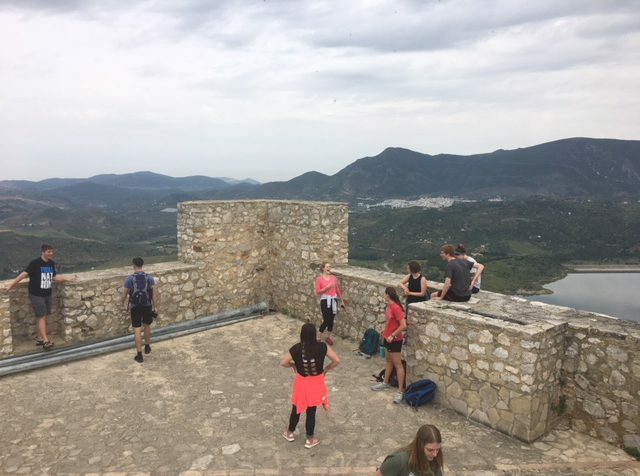 On Wednesday our entire group took the most epic field trip ever: we visited Zahara de la Sierra in Andalucia. 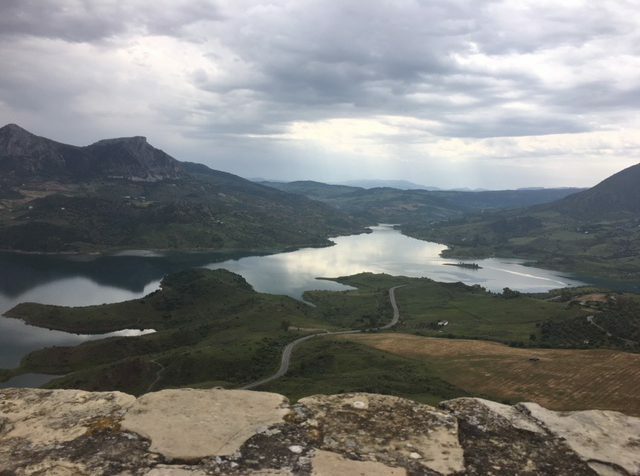 Zahara de la Sierra is the location of a 13th century castle perched on top of a mountain overlooking a picturesque waters of the Zahara-el Gastor reservoir. I don’t know very much about this reservoir or the castle, but I do know it’s arguably one of the most beautiful places in all of Andalucia. It took us roughly two hours to get to Zahara, but the sightseeing started almost immediately on the bus trip over. Once we were out of the city, the landscape around us gradually became more remote and rural. 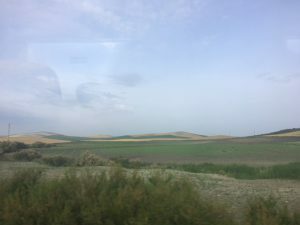 We passed rolling hills covered in thick foliage and patchwork fields of pristine grass and vegetable fields. The closer we got to Zahara de la Sierra, the narrower and windier the roads became, and it was evident by the way my eardrums were aching that we were gaining altitude. We first saw our destination from afar across an impossibly blue lake, and it was pretty awesome. 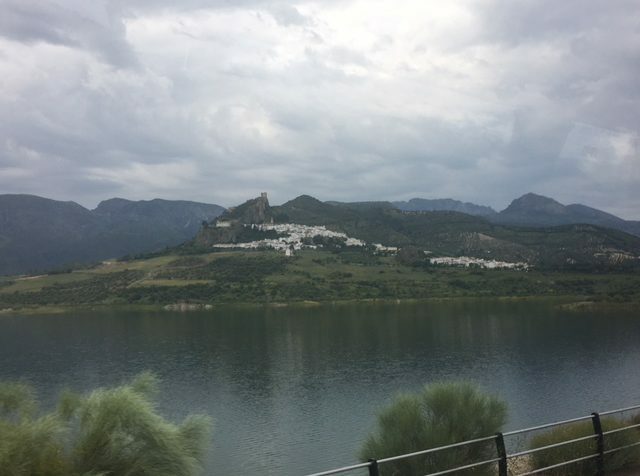 Zahara de la Sierra is one of the many Pueblos Blancos, or white villages, that Andalucia is known for. 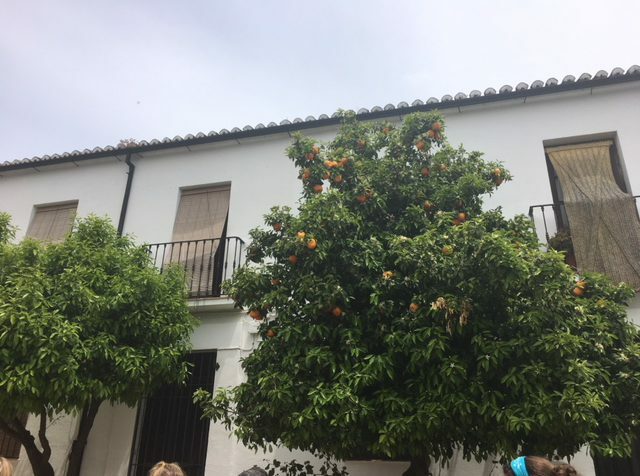 Pueblos blancos consist of two main things: white-washed buildings and orange blossom trees. This particular pueblo is situated in the shadow of the castle, which was originally built as a watchtower. It’s a bit of a hike up to the castle, but the view and leg workout are well worth the exertion. Vale la pena, as they say in Spain. 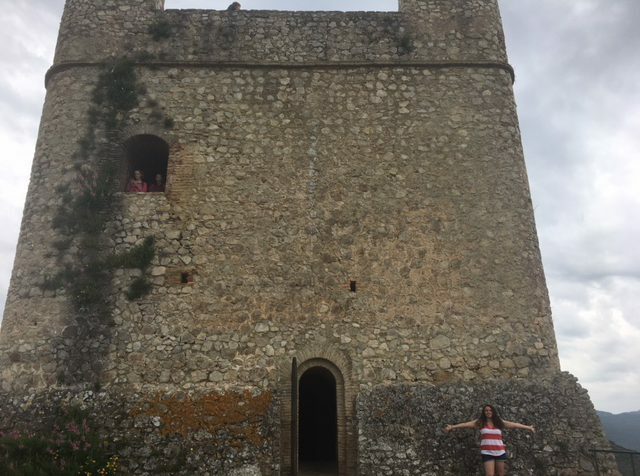 It’s not a very large castle (that is, as far as castles are concerned), but it’s ancient and still standing, so that’s reason enough to visit it. We were able to go inside it and climb to the top. There were no lights inside, obviously, so we had to use the flashlights on our phones to navigate the small space. Once we got up top, it was a breathtaking view. There was a nice breeze, and we loitered around for a while, taking pictures and discussing life. It was a very tranquil experience, and it definitely felt like we were tucked away in a lost corner of the world. 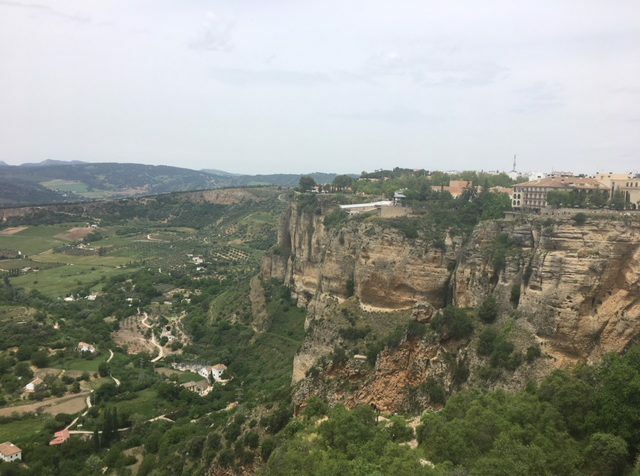 After Zahara, we clambered back onto the bus and drove another forty minutes or so to a city called Ronda. 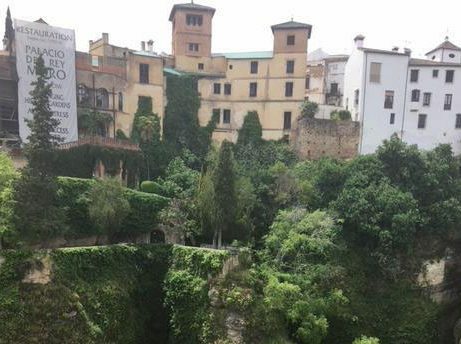 Ronda is also very beautiful, with narrow streets and beautiful views. 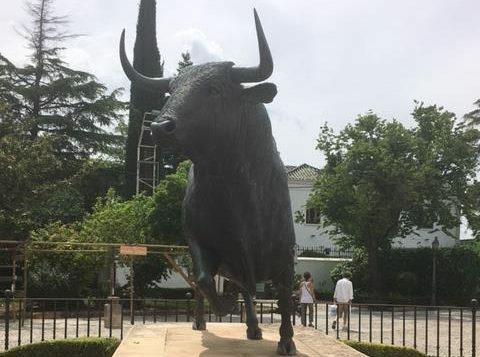 This city in particular is most known for las corridas de toros, or bullfights. Our professor, Salva, gave us a personal tour of the city and all of its history. (I would encourage you to look it up if you’re interested, because I don’t have the time nor the knowledge to recount it here). At the end of the tour, we gathered in the Plaza de Toros for an introduction to the bullfighting ring. 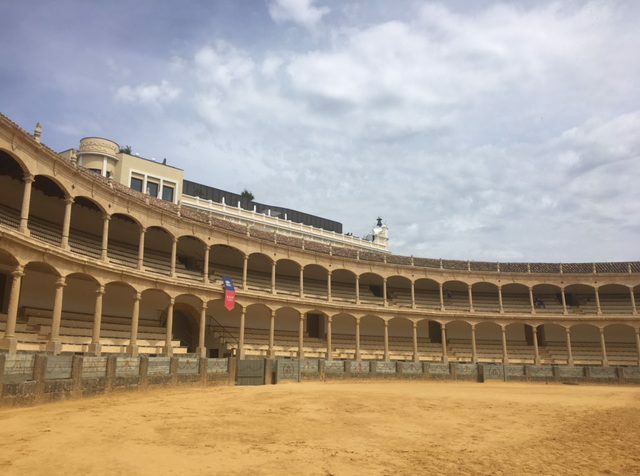 It was the first time I’d ever been inside a bullfighting ring, and, to be completely honest, it was kind of emotionally overwhelming. Bullfighting is a very popular and ancient form of entertainment in Spain, and it’s been a part of the culture for thousands of years. It’s technically considered a sport, but there’s lots of controversy surrounding the subject, especially in recent years. I’ve never been to one, and I’m not really sure I’d hold up very well emotionally if I went to one, but I’m in Spain! When am I going to get another opportunity to see a bullfight? I’m planning on going to one next term with my classmates. Oh, also, this is a pretty dramatic non sequitur, but Saturday the 26th also happened to be a very important day for Spain in regards to fútbol. From what I understand (which isn’t very much when it comes to sports), the final UEFA champions league took place that day in Kiev, Ukraine. I personally had no idea this was going on. 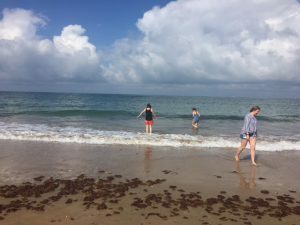 In fact, I didn’t find out until the ride back to Seville from spending a day at the beach in Cádiz. In case you don’t know, fútbol (a.k.a. soccer), is the life and breath of Europe – especially Spain. I’m not exaggerating when I say fútbol is king, and bread is a close second. Anyway, the fútbol team Real Madrid was up against Liverpool on Saturday, and apparently it was a pretty intense match. Madrid won three to one, and the radio announcers were going crazy. If I had known this was happening and how important it was to Spain, I would have made an effort to watch it, because fútbol is to Spain as fútbol americano (football) is to America: everything. My señora (that is, my host mom) doesn’t really watch sports, and she also doesn’t have much interest in it, so…oops. I watched a few clips from the match and previous matches before it, and I’ve gotta say…I didn’t know bodies were made to move like that. Those guys have got some serious talent! And finally, the beach! This is the last thing I’m going to write about, I promise, but I need to give it the credit it’s due. I’m from Holland, Michigan, so I’ve been to beaches before, but they’re nothing like the playas in Spain. I’m not typically a huge beach fan, but I can’t say that I went to Spain and didn’t go to the beach because that’s all part of the experience. 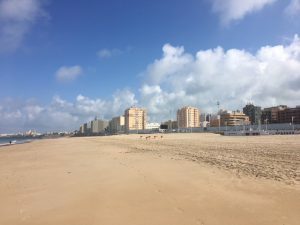 With that being said, a large handful of us planned to go to Cádiz for the day, a city on the southern coast with a cute little town and, of course, a great beach. The reason I don’t typically like beaches is because the water is always too cold and the sand is always too hot. Plus there’s bugs, rocks, crunchy sand between your teeth, and those little bits of beachgrass that hide in the sand and stick themselves in your feet if you aren’t careful. When we first arrived at the beach, the weather was actually pretty brisk. There was a nice breeze playing off the waves, and the sand was warm but not scalding. In fact, it was the softest, purest sand I’d ever felt. There were zero rocks and no bits of beachgrass anywhere. Several hours into it, I also realized there weren’t any bugs. You know those irritating little flies that bob around your head when you’re trying to relax? Yeah, there weren’t any of those. It wasn’t until well into the afternoon that the heat tested our endurance. Some of you might be familiar with the term siesta. It’s definitely a thing, but, contrary to popular belief, siesta does not mean that everyone in Spain simultaneously takes a three hour nap. In fact, they suggest that you don’t sleep for longer than half an hour because then you’ve wasted most of your day (Though I typically do, anyway, because siestas are a gift straight from the Lord). But in Spain, siesta time actually refers to the hottest time of the day: from three to eight in the afternoon. The only people who are outside during siesta are tourists, people who work, or crazy people. I’m exaggerating, of course, but that’s a pretty accurate illustration of how hot it gets. During spring, it’s usually in the eighties or nineties, but during the summer it can creep into the hundreds. Having spent the entire day at Cádiz, we were lounging around in the hot siesta heat for hours. I have really sensitive skin, so I re-applied my crema de protección de sol (sunscreen) roughly five times, but the sun still managed to create a pretty mosaic of bright red skin on my back. Overall, my experience at Cádiz beach was probably one of the most pleasant beach experiences I’ve ever had, and the view of the Atlantic ocean breathtaking, but I still felt like a human croqueta by the end of it. Hot, crispy, and covered in sand, our group made our way into the city to find a place to rest and eat. And that was how I ended my second week in Spain: tired and slightly burned, but very content and ready for more. SPANISH VOCAB: The word for “sand” in Spanish is arena, pronounced ah-ray-nah. Once you learn it, it’s one of those words that really sticks with you.